The MADELEINE, owned by Commodore John S. Dickerson of the Brooklyn Yacht Club and designed by Jacob Voorhis, had an illustrious history. She was built in 1868 by David Kirby at Rye, New York as a centerboard sloop. 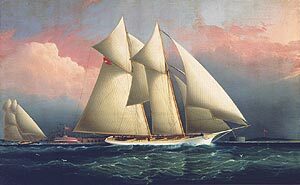 In 1870, MADELEINE was partially rebuilt and converted to a schooner, later becoming a member of the New York Yacht Club fleet in 1876. That year she defended the America's Cup against Canadian challenger COUNTESS OF DUFFERIN. Swiftest in the New York Yacht Club fleet, MADELEINE easily won the Cup. The COUNTESS was out-classed, and she lost two races by large margins. The old AMERICA sailed the second race unofficially and finished 19 minutes ahead of the Canadian schooner. MADELEINE's original builder's half-model still hangs in the New York Yacht Club. Her principal dimensions were 106 feet 4 inches on deck, 24 feet 3 three inches beam, with a draft of 7 feet, three inches.